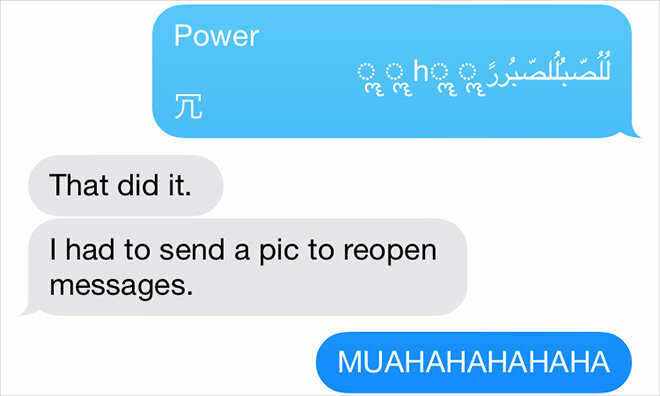 A peculiar iOS bug apparently that allows pranksters to crash a victim's iPhone by sending a text message from their own iPhone containing what appears to be a single line of seemingly innocuous Arabic script. AppleInsider reader Kaitlyn on Tuesday discovered that receiving the Unicode characters seen in the screenshot above through Apple's iOS Messages app triggers iPhone restarts, lockouts from Messages, Springboard crashes and more. A thread on Reddit narrowed down the system crash and reboot errors to iOS Unicode handling. More specifically, the Unicode string in question is part of a much longer block of text that cannot be fully rendered in Notifications. When a text or iMessage containing the text string is received and presented in the lock screen or as a drop-down notification, iOS gobbles up resources trying to render the message, ultimately causing Springboard to crash. The same line of code doesn't cause problems when received as part of a normal Messages conversation, suggesting the issue lies in part with iOS Notifications. Some suggest turning off Messages previews for Notifications, though our tests have not shown this process to be effective. If Messages has already crashed, however, AppleInsider has confirmed that receiving a new message, sending out a picture from Photos or sending yourself a message through Share Sheets will stop the process.